The GE OEC 9000 C-Arm was the original C-Arm that truly boosted OEC as a reliable model. This system remains a widely used, good quality imaging system that’s flexible enough for use in general surgery, orthopedic surgery, trauma, and pain management.After a scan, this C-Arm will display the output onto two 15-inch high-resolution monitors; when printing or transferring the images, this C-Arm has simple operation so that users can get the job done fast. The OEC 9000 C-Arm offers digital image processing and a screen resolution of 512x512x8. 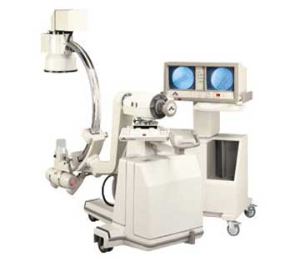 To provide the best image possible for accurate diagnoses, this C-Arm also features noise reduction, gamma correction, real-time averaging, and motion artifact reduction. Furthermore, the OEC 9000 C-Arm is very adaptable to specialty packages, whereas some upgrades allow this C-Arm to perform digital subtraction angiography and roadmapping for vascular surgery, interventional radiology, neurology, and neurosurgery.